A very clever version of a Christmas tale base on the poem, ‘Twas The Night Before Christmas. I was immediately drawn to it by the cover and clever play on words in the title. Who can resist a bright and vividly illustrated picture book read aloud? 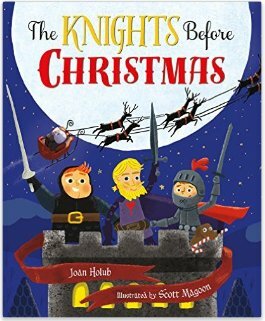 The book’s large size makes it perfect for toddlers and preschoolers to hold, while the clever conversation among the knights provides a humorous and modern version of the Christmas classic for older siblings. Brave Knight, Silent Knight and Polite Knight are entrusted with the responsibility of guarding the king’s castle. On Christmas Eve, a stranger in a red suit appears accompanied by eight dragons seeking a chimney to enter. Of course a castle does not have a chimney. Santa remains undaunted and determined to enter and leave his Christmas gifts, while the three knights redouble their efforts to repel the invasion. Who will win the battle? I believe this book is destined to become a new Christmas favorite among teachers and parents of preschoolers and primary grade readers. Available in kindle and hardcover editions. ‘Twas December 24th, and three brave knights were just settling in for the night when out on the drawbridge, there arose such a clatter! The knights try everything to get rid of this unknown invader (Santa Claus! ), a red and white knight with a fleet of dragons . . . This parody of Clement Clarke Moore’s well-known poem ‘Twas the Night Before Christmas is kid-friendly, clever, and just plain silly. Sure to become a holiday classic of a different kind! Joan Holub is the author of 140+ books for children including the acclaimed picture books Little Red Writing, The Knights Before Christmas, and Mighty Dads, a New York Times bestseller. Joan co-authors (with Suzanne Williams) three series: Goddess Girls (ages 8-12, Greek mythology with a middle school twist), Grimmtastic Girls (for ages 8-12, fairy tale adventure with a middle school twist), and Heroes in Training (ages 6-11, Greek mythology adventure chapter books). Watch for her upcoming chapter book, What Was Woodstock?, and her board book, This Little President, both available in early 2016! The poem is so famous; it has universal appeal! This book looks so adorable! Thanks so much for sharing this at Booknificent Thursday! I just wanted to let you know – I’ve moved this post from the Mommynificent Christmas Reads over to the link-up on Desperate Homeschoolers (https://bamauthor.me/2015/11/18/the-knights-before-christmas-book-review-blitz/). I’m trying to keep the one on Mommynificent for Christmas reads for adults and the one on Desperate Homeschoolers for Christmas books for kids. Thanks so much for linking up! Take a peek.. I think that your children will enjoy it! This sounds like such a fun story. My boys would love this! Let me know what they think if they read it.